In late 1994 I spent a week in the Hopi villages showing film and photographs I have gathered during 15 years of exploring the remote canyons of the Four Corners area. Inspired by stories of Pueblo clan migrations and pulled by the incredible beauty of canyon country, I have come upon hundreds of village sites, kivas and panels of mysterious messages carved in stone. Images of these ancient petroglyphs flashed on the screen as I presented a slide show to a group of Hopi elders in their thousand-year-old village. They gazed at rock writing left by their ancestors as the clans migrated in spirals toward the heart of the Colorado Plateau. One image lingered on the screen as the elders spoke in Hopi for five minutes, discussing what they saw. Martin Gashweseoma of Hotevilla spoke for another five minutes, walking to the screen and pointing at one figure after another. There were birds, squiggly lines, giant spirits wearing headdresses, bighorn sheep and a cross inside a circle. After Martin had finished, I asked what was said. His interpreter said cryptically: “It tells a migration story.” The silence that followed said: some things cannot be told. This went on, image after image, long into the night. We are guardians of this land, she said. It is the home of Massau, the Great Spirit. I’ve been hanging out in that kitchen on and off for 17 years, talking, listening, laughing, and waiting. A lot of waiting. As the coffee brewed my mind raced with pent-up questions. Will a film do any good? What are the right stories to tell? Why should the Hopi help Euro-Americans understand sacred sites, the relationship of prayer to land, the importance of making offerings? Where and when can I interview Thomas? Instead of my filmmaker’s agenda we discussed family, the corn harvest and the upcoming dances. Fermina and Thomas got up and headed into Flagstaff to do some errands. Silence echoed through the house. I sipped my coffee and listened to the ticking clock. These things take time, happen in their own time. I’ve waited for years. I can wait some more. Why do I feel that I must be doing something, making something happen, all the time? I took a deep breath and waited some more. There was a knock at the door and in walked Dale Jackson, a Hopi from Oraibi, the oldest continuously inhabited town in North America. “Want to go have a look around the old village?” he asked. A few minutes later we were picking yellow flowers for a medicinal tea called hohoysi. There was a rock shrine that opened to the east, in the middle of a corn field. We said silent prayers and Dale instructed me how to make corn meal offerings to the spirits protecting the field. As we walked toward Old Oraibi, he pointed out the “mother of all animals” shrine. “She lives here,” he said, “rabbit, deer, bear – the mother of all of them.” We say a prayer and offer corn meal once again to a small bush distinguished only by the weathered eagle feathers tied to it. We walk a long ways to an east-facing rim and a place Dale describes as a resting place for ceremonial dancers. A flat, low stone wall runs north to south in a curve and I imagine a row of masks waiting as the dancers rest – kachinas sitting in a circle on a stone bench around the fire, smoking and praying. There are some ashes in the center of the fire pit, and some partly burned sticks. “This is the place where Massau had his fire when we first came here,” he says. I am tingling. We sit in silence for a long time. Some things we may one day get to film. Some things we definitely will not. A year later, November 1995, I return with a film crew hoping the time is right for an interview with Thomas. We wait for days. Thomas is tired from ten days of traveling but says that if and when he feels rested we can do an interview. Dale takes me on a scouting trip to select a site for the interview and because it is near the village of Hotevilla we need to ask Martin for permission. He is weaving when we arrive and his wife serves us tea. 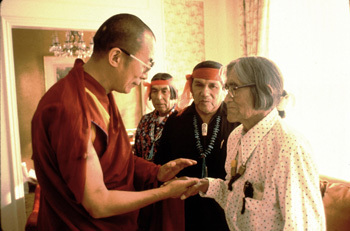 We reminisce about his journey to meet with the Dalai Lama in Santa Fe in 1991, which we filmed. Until that time, Martin had been custodian of an important stone tablet. He shows us a drawing of the image on the stone tablet. It is a hand with two circles around it. I ask what it means. Next morning we set up our camera at the edge of Third Mesa. Thomas says a prayer invoking the power of the four directions, asking permission to be there. He offers corn meal to the wind. In the camera’s view, over his left shoulder, is a sacred site. After 45 minutes, Thomas is tired and we wrap. Of 15 questions I had hoped to ask, the first three were answered. I realize this is to be a series of interviews at various locations. The story is telling me how it wants to be told. We plan a road trip for the spring to Chaco Canyon and the Black Mesa coal stripmine, where there are 2,100 archaeological sites, of which 800 have been destroyed so far. Two days later the road trip has begun. Thomas is to give two talks on Hopi prophecy at the Whole Life Expo in Las Vegas, and we go along to videotape his presentations. All goes well – except for the unavoidable, mind-numbing scenes in the casinos. Slot machine madness. Can there be any other place where people are more disconnected from the natural world? In the hotel lobby, with slot machines ringing and quarters pinging, we rewind the videotape to have a look. The $50,000 camera eats the tape, abruptly ending the session. Days later, back in San Francisco, we find we can salvage just seven seconds of the shot of Thomas walking. However, the interview scenes at Hopi and in Las Vegas are pristine. There is a pictograph panel in southern Utah called the Processional Panel. It contains a large circle with long lines of people extending to the four directions. These are people who have found the center of the world. There they stand, century after century, waiting. At a summer fire ceremony in a meadow beneath the snowcapped volcanic form of Mt. Shasta, Florence Jones, 87-year old medicine woman of the Wintu people, announced her retirement. She took off her eagle feather headdress and directed two of the people she had chosen to succeed her to put their hands inside the band of the headdress and vow to continue the ceremonies that had been passed “from generation to generation on down to me.” From my seat among 200 people gathered in a circle around the fire, I watched Florence begin to sing a song to close the ceremony. Suddenly, I heard a loud “swish-swish-swish” to my right. Looking over I saw a whirlwind swirling across the meadow, moving straight for Florence. It moved into the circle of people, with the center of the whirlwind a few feet behind Florence. Her hair blew around her head and she steadied herself against the intense wind. The umbrella over her chair shook furiously and a second umbrella a few feet away that was shading another elder was blown upwards and inverted in the wind. Men scrambled to secure the umbrellas as Florence continued to sing. Slowly, the whirlwind passed on and entered a wall of trees whose green branches shuddered as the gust hit them. The wind died as it reached the trees. Its strongest surge was around Florence. I closed my eyes for a second to insure that I was awake, sober and sure of what I had experienced. I saw no one in the crowd acknowledge the whirlwind. There were no exclamations, just calm and quiet – as if things like that happened every day. “Did they cut them out of ignorance or do you think it was intentional?” I asked. “They looked me in the eye and promised not to cut them,” she replied. We set a date for a trip to the grove. Then I asked her about the whirlwind. 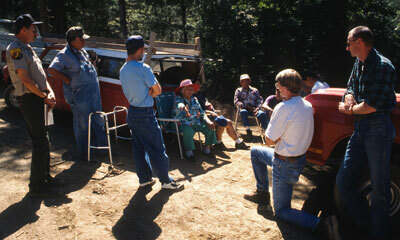 Two weeks later, a crowd was gathering at our designated meeting place – an archaeologist from the California Department of Forestry (CDF), three men from the logging company and four Indians. When our caravan pulled up, the crowd swelled to 16, including Florence and her attorney, Claire Cummings, all of us there to inspect what was left of the sacred grove. We introduced ourselves. The company forester, Dan, a short, serious man in a blue company hat, looked embarrassed. He said it was his fault that the trees were cut. 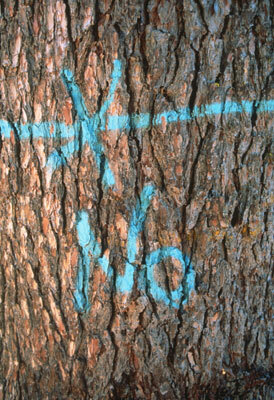 He had marked them all with blue paint: X-ing out the previous marks that indicated “cut this tree” and painting the word “NO” on both sides of the trees. He had also marked the whole area – which Florence had told him was a men’s ceremonial fasting area – with a series of pink ribbons tied to tree branches to identify the grove as an archaeological site. Steve identified himself as Will and Dan’s boss. He said he had come to make sure things got worked out and made right. He said he was authorized to make commitments for restoration of the site. We agreed it was time to go up and assess the damage. Florence stirred in her chair and stood up. Her face was tight and she looked angry. The men hung their heads and apologized again and an awkward silence descended upon the encircled group. It was time to drive up and see how many of the trees had been cut. Continuing up the dirt road through the forest, there were dramatic glimpses of Mt. Lassen to the east and Mt. Shasta to the north. Florence told stories about bears, mountain lions and rattlesnakes she had encountered here during the years when she was learning to be “top doctor” of the Wintu – 38 years of studying plants, beginning with a long, solo pilgrimage at the age of ten. We arrived at the logging site. Up a dirt embankment was a row of sugar pine trees with blue lines around them and “NO” painted on their bark. Directly behind the sugar pines, about ten feet away, three big Doug Firs had been cut, even though they were clearly within an area marked by pink ribbons. Four other smaller trees had also been cut. One big sugar pine near the edge of the grove had been cut, as had a four-inch diameter sugar pine that was growing next to one of the big trees with “NO” marked on it. Looking north past the massive stumps was a dramatic view of Mt. Shasta – a direct visual connection from one prayer spot to another. “Was it marked?” someone asked. “I can’t remember specifically marking that,” replied Dan, who had earlier said he had painted “NO” on two sides of all of the trees within the flagged area. The state forester asked about the small trees that had been cut. Dan explained that the little trees were crushed as the big trees fell. Florence stayed by the cars because the embankment was too steep for her. After we gathered and described what we had seen, she continued her explanation of why what the loggers had done to the ceremonial fasting site was a violation of Wintu traditional religion. When there was nothing more to be said, we got into the cars and headed further up the mountain. As the sun began to sink toward the horizon we reached the top. We walked a trail out of the forest into a clearing with a view down to the McCloud River and the Trinity Alps to the west. Florence took the three company men over to a gray rock at the end of a grassy clearing. Dan took off his hat, glasses and watch and went up on the rock. He knelt down. There was a long silence. I wondered what was going through these three men’s minds. I imagined each of them to be Christians. They seemed respectful towards Florence and remorseful that the trees had been cut. But praying on a rock and getting in touch with their feelings in front of a band of Indians and their activist supporters was definitely pushing the limits of their experience. Dan came down and apologized for causing Florence pain. He spoke in muted tones. When he was finished, Florence said “That’s what I wanted to hear.” She took his hand in hers and held it, and smiled. Will stayed up on the rock a long time. When he came down he looked at Florence and said: “I am not a very spiritual person. I feel sorry for what we did.” When he was done she thanked him and took his hand. Driving back down the mountain, I wondered whether the loggers had jumped into their truck and called their day’s experience witchcraft. I don’t think so. It felt to me like their souls got stirred up there on top of the mountain, stirred by an old woman who seems like she is not ready to retire. One criminal misdemeanor charge has been levied against the logging company, and a non-criminal administrative action may be lodged against their forester. The total fine in the case is $500. The lumber from the three Douglas Fir trees and one sugar pine that were cut from the sacred grove is worth an estimated $20,000. The company has done the promised restoration work at the site and is negotiating with Florence’s attorney, Claire Cummings, for permanent legal protection of three Wintu sacred sites that are on land owned by the company.